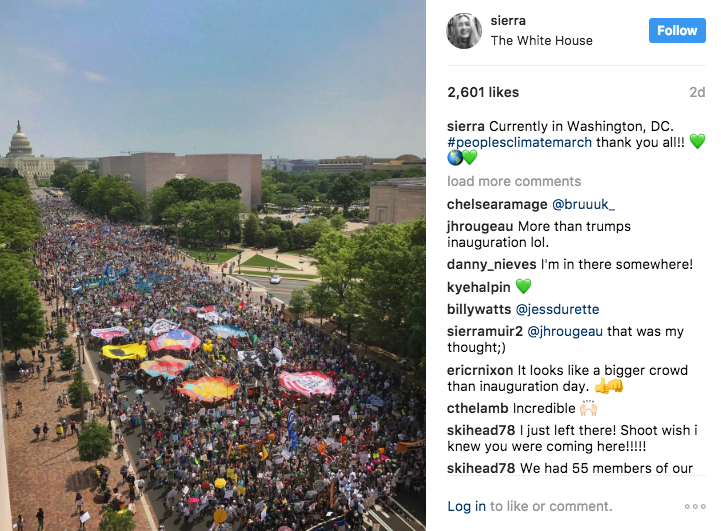 On April 29th, over 200,000 people showed up in Washington, D.C. to march on behalf of climate action. The People’s Climate March in our nation’s capitol was sweltering, but dedicated activists took on the heat and climate deniers with plenty of energy, bright signs, bold banners, and earth inspired artwork, music and dancing. 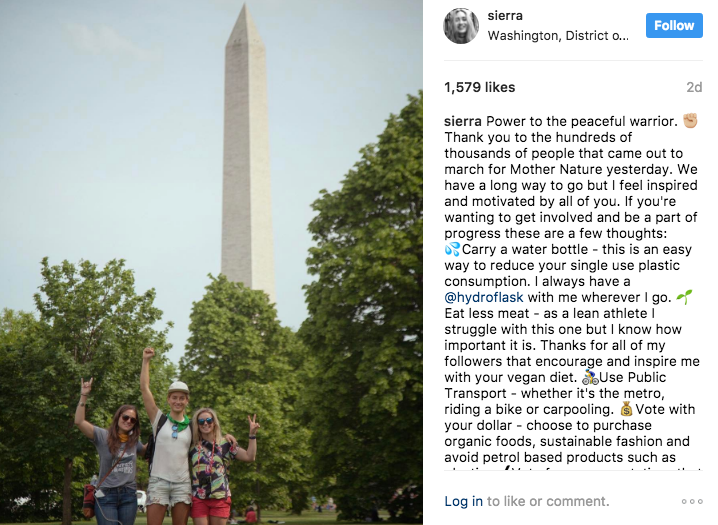 It was a peaceful celebration of the outdoors, healthy communities, and the incredible environment that is currently facing a lot of political heat in Washington, D.C. 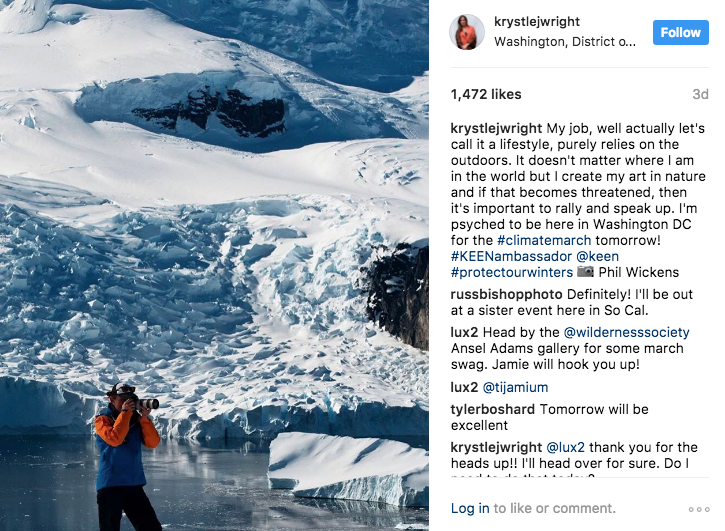 Among those 200,000 people were professional adventure athletes that are standing up and speaking out against climate change. The world of outdoor recreation is under fire and increasing evidence of climate change is threatening the snowpack, lakes, rivers, beaches, mountains and trails where they work and play. 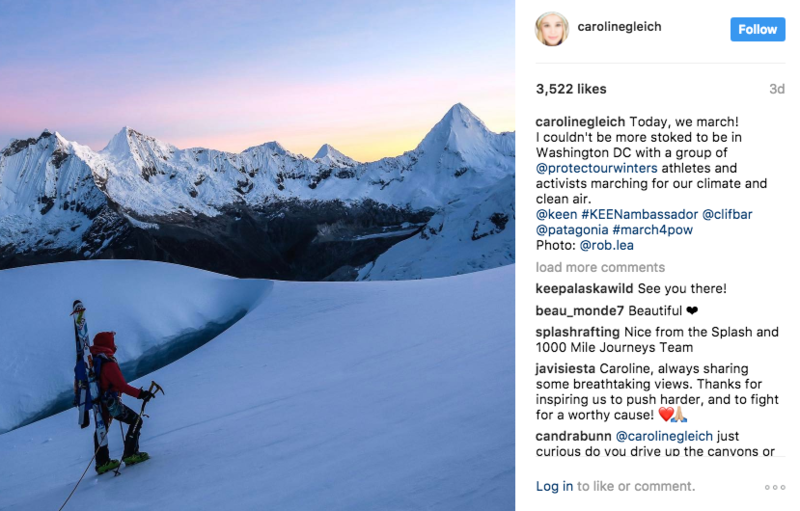 7.6 million Americans are employed thanks to outdoor recreation and all of us, from a professional snowboarder to the lifty at your local resort, have something to lose if climate change isn’t taken seriously. 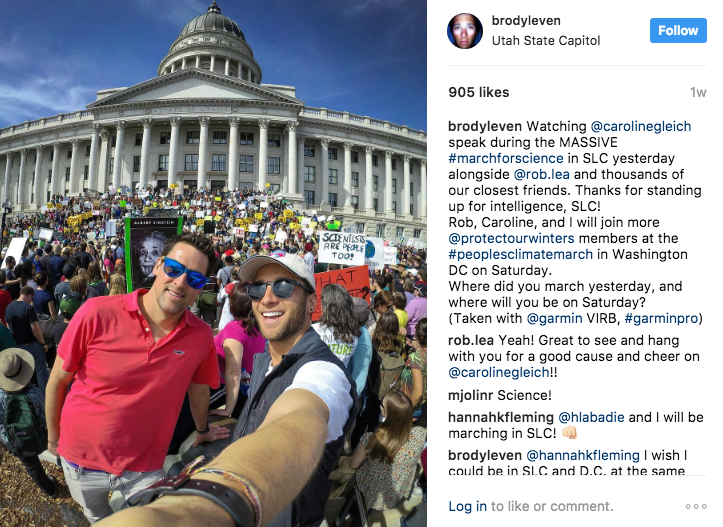 After the march, I caught up with Dakota Jones, Caroline Gleich, Sierra Quitiquit, Brody Leven, and Krystle Wright, who all participated in the D.C. event with Protect Our Winters. Here’s what they have to say on climate action, personal experiences with a warming planet, and President Trump. 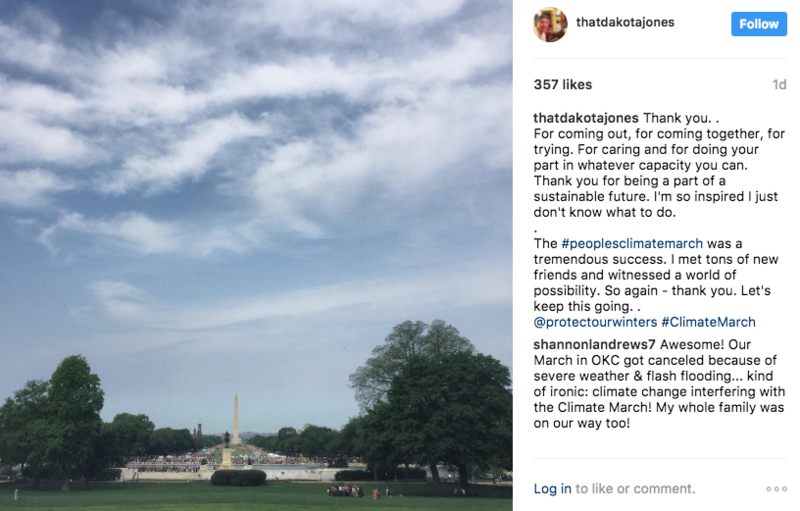 “I attended the climate march to demand action on climate. The future of the snow sports industry is in jeopardy and my job (and many others) are at stake. Inaction on climate is not an option. “I think that while it’s an easy time to get overwhelmed and frustrated it is also a really empowering time to get involved. I used to get overwhelmed by politics because I’m just one person. I have really tried to shift my mentality on this because it’s when we come together with a shared voice that we can actually get things done. People who participate in snow sports have seen climate change in our lifetimes. It makes it that much personal. Our seasons are getting shorter, it’s raining instead of snowing. Climate change is not something way off in the distance, it’s real. Our biggest immediate challenge is working with this administration that is not going to make policy change that favors the environment. Right now it’s more important than ever. We need to do our part by partnering with NGOs like POW that are making real time changes. Things are going to get worse before they get a lot better. “We all have a small voice but when we come together, that voice is a lot louder. It's important to share our message with the powers that be on the importance of protecting our wild lands and climate. ““I didn’t go to the People’s Climate March for fun. I don’t like crowds and I don’t like heat; there were 200,000 people and it was a humid 95 degrees. 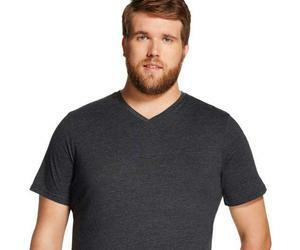 But it wasn’t about my personal experience, it was about doing my part to vitalize this necessary movement. At one point I looked around and noticed that while some chants and signs were directed at Trump and the administration, the rest were directed at us, the marchers. We were there to remind one another that we aren’t alone, we got each other’s backs. It wasn’t about what we are against but what we are for, and what we were for is collective climate action. We weren’t just talking to Trump, we are talking to one another, saying, “You can do this. We can do this." 200,000 people doing their best is a lot more powerful than one douchebag in the White House doing everything he can to stop us. Regardless of the fact that outdoor adventure is how I make my living, being a part of the climate change conversation is ethically the right thing for me to do. My heart won’t let me be a passive bystander. In my core, I care. “My job is my lifestyle, and it completely revolves around the outdoors. When where I work and play becomes threatened, I am not just going to sit back and say, oh, thanks for the ride, you are on your own. As an international visitor to this country, I come here because I fell in love with the landscape of the U.S. It’s so dramatic and it floors me that this could be taken away. I worry so much for the next generation and what we are leaving with them. We need stronger policies. Trump is a complete fuckwit with no understanding for anything but his own agenda, to be blunt. He has no respect for previous presidents and no national monument should be reevaluated. It is important to vote for who you think should be in government. We need to simply protect what has been established already. How can you ignore 200,000 people coming to D.C. to showcase their love for the outdoors? It’s not just showing up to a march and saying cool, I’m done. It’s an uphill battle and this is just the beginning.